This is near to Brunel University, on Pield Heath Road. It is reachable by public transport from Ruislip by the U1 bus, which goes past the hospital. It is a general acute hospital and has full A&E facilities. There is also an Urgent Care Centre (UCC) where patients can be seen by a GP. 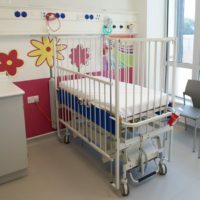 It has extensive out-patient facilities. This is in Northwood, on the Rickmansworth Road. It is reachable by public transport from Ruislip by the 331 bus, which goes into the hospital. It is an elective hospital, ie. it only does planned operations. There is a large out-patients department, called the Treatment Centre. There is also a Minor Injuries Unit that can treat sprains, broken bones, infected wounds, etc. It cannot treat chest pains, breathing difficulties, major injuries, gynaecological and prenatal issues. For these you should use the A&E department at Hillingdon Hospital. 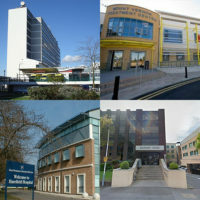 Mount Vernon Cancer Centre – the biggest cancer centre in the south of England. It is run by East & North Herts NHS Trust. The Paul Strickland Scanner Centre – a specialist scanning facility. The Lynda Jackson Macmillian Centre – a cancer care facility. The Restoration of Appearance and Function Trust (RAFT) – a specialist burns and reconstruction centre. The Michael Sobell Hospice – a palliative care centre. This is in Harefield, near to the Village Green. It is reachable by public transport from Ruislip by the 331 bus, which goes past the Green. It is specialist hospital working on heart and lung problems. The first heart transplant in Britain took place here. These are provided by Central and North-west London Foundation Trust (CNWL). The main mental health facilities are at the Riverside Centre, which is located just south of Hillingdon Hospital. There is also the Pembroke Centre on Pembroke Road in Ruislip Manor.